It is safe for me to be rich and frugal. It is safe for me to get excited about money. It is safe for me to look wealthy if I want. It is safe for me to pick the most expensive thing on the menu if I desire. It is natural to have an abundance in finances. It is safe for me to have a lot of money. It is safe for me to look at my finances with love. I am deserving and grateful of the money I am given. It is safe for me to release overused limiting money beliefs. It is safe for me to make money while I sleep. It is safe for me to use my money to create magical experiences. It is safe for me to make a lot of money. It is safe for me to invest. It is safe for me to make important financial decisions. It is safe for me to travel First Class. It is safe for me to have wealth in every area of my life. It is safe for me to earn more than everyone around me put together. It is safe for me to have multiple streams of passive income. It is safe for me to earn more than my mentors. It is safe for me to be a rich and powerful person. I deserve every cent I am given. I attract abundance all by myself. Money comes to me from anywhere, from anyone, at anytime. Large sums of money come to me easily and quickly. I am living in a place which allows me to prosper at a price I can afford. Travel is easy to afford. I am certain the things I desire are on their way and are coming in a delightful and surprising manner. I deserve the good I am gifted. I achieve enough abundance for the things I want. I am receiving things that I want that others want to give away. I deserve the money I am given. 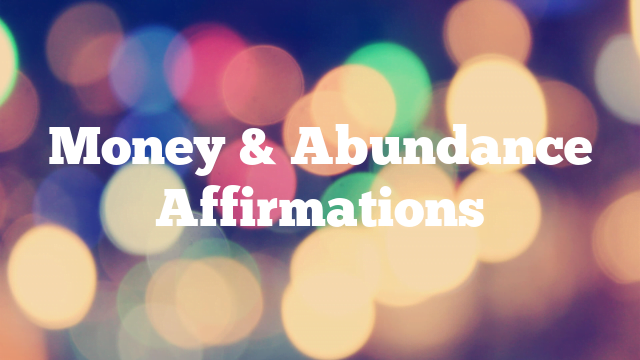 I allow abundance and prosperity on a higher level than I have ever allowed before. I allow an abundance mindset. The universe supplies me with everything I want in time. I am quickly manifesting the things I want on a daily basis. I deserve and accept my financial abundance to accomplish the things I desire. My financial abundance creates financial abundance for others. Debt comes in and out of lives easily. Bills and debt show me I am trusted. I am friends with my bank account. I am friends with my debt. There is enough money to fulfill everyone’s needs at all moments. Money comes in and out of my life fluidly and at the exact perfect moments. I am a magnet to money and success. I am so happy and grateful now that money comes to me in increasing quantities through many sources, on a continuous basis. Everywhere I go I prosper. The universe’s wealth flows to me easily. I have more money than I can even spend.